CRM software automates such tasks as contact management, communication tracking and scheduling, and sales forecasting. The size of the CRM industry is now over $10 billion with hundreds of competing offerings. Below is a look at the most popular options as measured by a combination of their total number of customers, users, and social presence. When choosing the best CRM software for your company, there are many factors you might want to consider. Do you need an on-premise solution or something in the cloud? Are you serving only local customers, or do you have customers all over the world speaking many different languages and communicating with your business in a variety of ways? How much are you prepared to spend? And at some point, you may ask: how good is the reputation of the vendor? One aspect of a CRM vendor's reputation is its popularity overall and in your industry in particular. Capterra, a software company that matches businesses with their ideal software, has released an infographic that illustrates the most popular CRM software solutions and the sizes of the vendors that sell them. The infographic also breaks down the popularity based on the total number of customers, total number of users, and total number of social media followers. 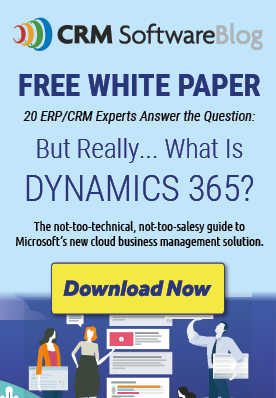 What are the Differences Between Dynamics CRM and Salesforce.com? I read many blogs about CRM solutions and sales force is first everywhere. But for small businesses I believe infusionsoft is the best which has a full blown autoresponder and affiliate system. This is one of the best blog regarding Software solution thanks for it. There are so many great startup CRMs in the market right now that aren’t even in this list. In terms of features and great user experience i’d be hesitant to recommend any of the top 10 in this list. here is my shameless plug – http://www.saleslifecycle.com. Nice piece of information! In conclusion CRM software solutions have low social media impact from SMB vendors, except few which are focused mainly on twitter.